Commonly, filters and strainers are positioned to capture solids and particulate. The filter will obstruct the flow through the pipe lowering the pressure on the downstream side. These effects may vary depending on the filters construction. Filter media is the material that removes impurities. The smaller the pores the larger the friction. Higher friction means greater pressure drop. Contaminants for particulates that buildup in the filter will reduce media flow. As the filter becomes clogged the downstream pressure drops. This results in an increased differential pressure, also referred to as the Delta-P. Saturated filters may also begin to shed captured particles. With the filter no longer functioning properly, the contaminants can escape into the process. This is why proper monitoring of pressure drop is crucial. So how can we measure the DP? Placing taps both before and after the filter, a differential pressure measuring instrument can be connected to detect the high side and close side pressures. the instrument will report the difference between the two sides. The saturation point will be indicated when the Delta-P value reaches a predetermined threshold. This value is derived from a calculation that factors in the flow rate, fluid viscosity, and filter characteristics. When specifying a differential pressure instrument there are two important factors to consider. The first is the DP range, which is based upon the most difference in pressure that the restriction is likely to produce. The second is the instruments ability to contain the line or static pressure level. For more information on pressure measurement, call Mead O-Brien at (800) 892-2769 or visit www.meadobrien.com. 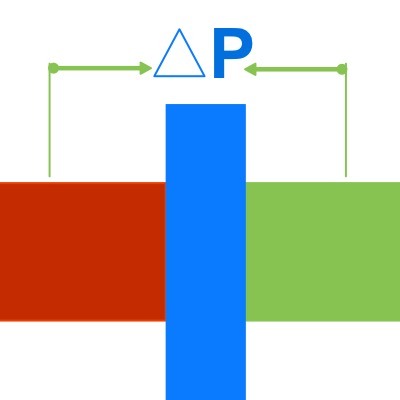 Here is a great video, courtesy of Ashcroft, that provides an excellent visual understanding of differential pressure.